A new waterproof motorized wheelchair that runs entirely on compressed air was unveiled today at Morgan's Wonderland, a 25-acre theme park in San Antonio, Texas. The park was built specifically for individuals with disabilities, and 10 of these chairs will be available to patrons at the venue's new splash park, Morgan's Inspiration Island, when it opens later this spring. 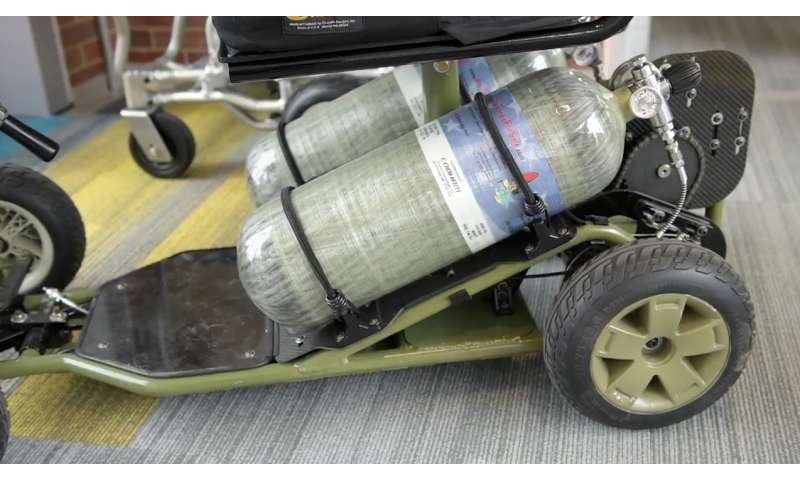 Designed, developed and constructed at the University of Pittsburgh Human Engineering Research Laboratories (HERL), the patent-pending PneuChair uses high-pressured air as an energy source instead of heavy batteries and electronics. The chair weighs about 80 pounds overall and takes just 10 minutes to recharge, compared to eight hours to charge an electric mobility device. HERL, which is a joint effort between Pitt, the U.S. Department of Veterans Affairs and UPMC, was already working on a prototype of the PneuChair when it heard from representatives from Sports Outdoor and Recreation (SOAR), a nonprofit organization established by The Gordon Hartman Family Foundation of San Antonio to oversee Morgan's Wonderland. They asked HERL for help in developing powered mobility for the new splash park. "Their needs and our research were essentially an ideal match," says Rory Cooper, HERL director and distinguished professor in the Department of Rehabilitation Science and Technology at Pitt. "The potential to open opportunities for people with disabilities who need powered mobility to access splash parks, water parks, beaches or pools is transformative." Brandon Daveler is a Pitt graduate student researcher and the lead mechanical design engineer on the project. "The PneuChair uses a simpler design without a lot of electronics and software," he says. "If something goes wrong, any of the components can be purchased at your local hardware store." The maximum distance on one fully charged tank is around three miles, about a third of the distance an electric chair can travel before it needs to be recharged. Pitt and SOAR are looking to establish a long-term licensing agreement wherein the PneuChair could be used in a variety of markets—personal care homes, shopping venues, grocery stores or airports. How do they cool the tanks down with such a fast fill-up? There's a reason why scuba tanks are filled submerged in a pool of water. You don't have to do that. Anyway, you wear scuba tanks so you need to handle them. There's no need to touch the tanks on one of these wheelchairs. Well, then you don't get the tanks full because the heat of compression increases the pressure in the cylinder temporarily. And that's a composite tank. They are sensitive to heat.